The problem can be simple (needs to sink slowly) or complex (needs to land like a ninja, maintaining correct posture while being a particular color, shape and size AND sinking at precisely 1.25" per second). Whatever the problem, the tier's creative drive goes to work, conjuring up prospective designs.The resulting prototypes get tweaked and trimmed and dunked, then tweaked some more. Sometimes years can go by as the pattern evolves towards a final state. More rarely, a bolt of eureka sizzles down from on high to hurry things along in an inspired flurry of materials. However it happens, in the end what the tier holds is the manifestation of an idea. Sometimes many ideas. It is literally thought-made-reality, and this is important to understand. To make an allusion already well-discussed among fly fishing authors, a fly is a small piece of a tier's soul. If you don't believe me, spend some time tying a perfectly proportioned pattern and then go hang it in a tree on the first cast - (cringe). "Well Austin that's nice", you may say, "but what does that have to do with the Rojo Bug?" Good question, Reader. I am glad you asked. I had a problem. A big problem. I was casting at redfish that seemed to be feeding and they wouldn't eat anything I threw at them. To make a long story short, I got frustrated. 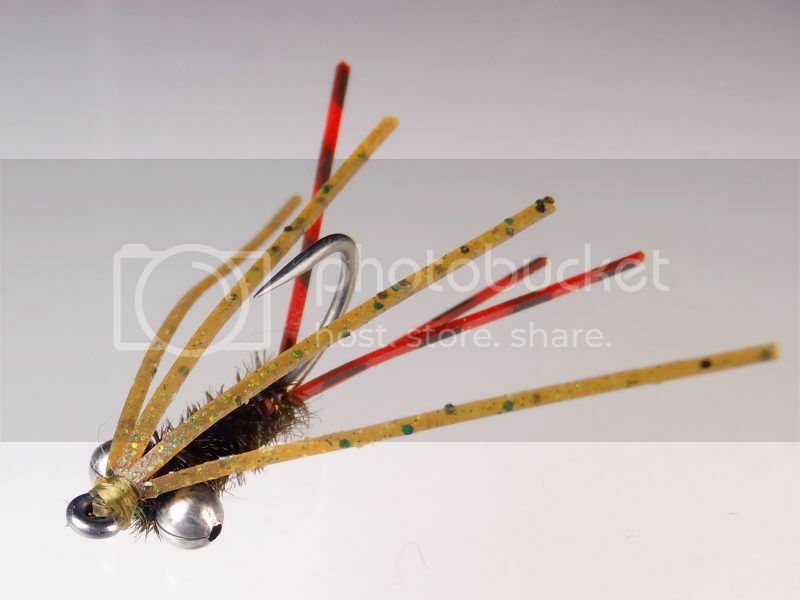 Developing a concept in my head while I was out on the water, I went back to the Fly Cave that night and messed around with material combinations until suddenly the Bug appeared on the vise in all its glory. It didn't have a name, (I don't name a fly 'til it has proven successful), but it had a slim silhouette, great motion and suggestive bugginess. I knew it was a winner the moment I held the finished fly in my hand.The next time I got after those tough redfish, I tied on my new fly. The first fish I cast to munched the Bug with abandon. It's the little things. Then I headed up to the rivers of Central Texas and started chasing river carp in the clear hillcountry flows. The first carp that saw the Rojo chased it down and vacuumed it with authority - we have a winner! Now, a few years later, the fly has claimed: white bass, black crappie, channel catfish, carp, largemouth bass, spotted bass, numerous species of sunfish, spotted gar, longnose gar, freshwater drum, rainbow trout, redfish, speckled trout, black drum, piggy perch, ladyfish, ribbonfish, sheepshead, cigar wrasse, trumpetfish, and lizardfish. Most lately the fly has passed from my mind to my vise to the fish, and on to the final audience - fly fishers at large. Fly Carpin' is a tremendous blog dedicated to all things carpy. Trevor is the captain at the helm who ain't skeered of organizing a fly swap - the biggest carp fly swap in the world to be exact. I figured this was a fitting stage from which to bequeath the Rojo Bug to the carp community. Every parent likes to see their child get a good start after all. Then I found out that CarpPro Magazine had caught wind of the whole deal and was going to do a full spread on the epic swap! The Rojo with the mojo went from personal secret to published in a matter of two weeks. That's just how it happens sometimes. The Rojo Bug is just another variation on a theme, but it's MY variation. If you tie a few up for yourself, please send me pictures of fish that fell to the Rojo's allure - I'd love to see how well my children are doing out there in the wide watery world. Tight lines my friends, and keep it salty. Previous article:Serendipity – take a chance, catch a fish.